Nature provided you with a very efficient covering – the skin. Healthy skin is very effective as a first line of defence, but in the present environment where harsh chemicals, dyes, fuels, lubricants, paints, water and air pollutants, etc. are such an integral part of everyday life, the skin can surely use a little help in doing its job. Derma Guard helps maintain healthy skin by protecting it from corrosives and irritants while providing nurturing moisturisers. Derma Guard is a non-greasy, and completely safe highly refined formulation that offers your remarkable protection for any area of your skin. After application Derma Guard quickly forms an invisible”micromesh” layer that will protect your skin against most skin irritants. Derma Guard provides your skin with a barrier against continued aggravation of abused sensitive skin and aids in halting the continuation of skin irritation even after repeated washings. Derma Guard does not wash off the skin, but rather disappears by sublimation as the dead skin cells to which it is attached slough off. For maximum protection, Derma Guard must be reapplied every three to four hours. The directions on the can must be followed carefully. Derma Guard contains Lanolin, Aloe Vera and Natural Vitamin-E which help moisturise and nurture the skin while protecting it. It will not clog the skin’s pores nor affect the sense of touch or the natural mobility of the hands. Derma Guard is “environmentally friendly” and is CFC free. 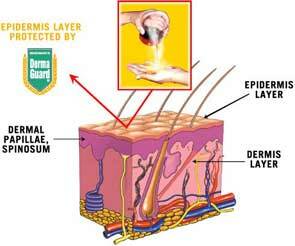 Derma Guard is not a medicine, nor is it a substitute for conventional protective measures or devices such as gloves. It provides additional protection in the event of the primary protection failing or if no primary protection is used. How does Derma Guard protect the skin? Derma Guard offers the extra protection the skin needs by creating a barrier which actually helps protect the skin against penetration by undesirable elements. It does this whilst allowing the skin to breath and perspire normally – processes which are essential for good health. Derma Guard is not guaranteed to protect the skin against every possible substance. However, it has been clinically tested and proven effective in protecting the skin against penetration by most skin abusers. Click here to see the chemical list. Derma Guard helps protect against oil and grease, resins, glues (including super glue), caustic sodas, petrol, diesel, paraffin, copy toner, industrial disinfectants, most inks, lacquers, synthetic soaps, and most parts. Derma Guard also helps to protect the skin against cement, abrasives, paints, lime, oils, greases, strong odours, fibreglass, resins, glues (including super glue), petrol, diesel and most solvents. Derma Guard will provide temporary emergency protection against acid, phosphoric acid and citric acid. Users must wash their hands and skin as soon as possible after such contact to avoid eventual acid burn. Derma Guard provides additional protection for doctors, dentists, nurses, care providers, dental hygienists, emergency services & para-medical personnel as well as other health professionals who frequently wear latex or vinyl gloves, or have to wash their hands frequently or who’s hands are un-protected. In circumstances where gloves cannot be worn, Derma Guard helps protect against laboratory acids, penetration of biological fluids (blood, haemoglobin, urine, saliva and other body secretions) caustic sodas, industrial disinfectants, solvents etc Derma Guard will provide temporary emergency protection against sulphuric acid, hydrochloric acid, nitric acid, phosphoric acid and citric acid. Users must wash their hands and skin as soon as possible after such contact to avoid eventual acid burn. Derma Guard will help protect against nappy rash because it builds a barrier between baby’s skin and urine. Even though it provides this protection, it remains non-toxic and safe for use on infants. It also provides the same type of protection for adults who have bladder control problems. Derma Guard provides a barrier against tender or abused skin that can be irritated in the food preparation process. It also protects the skin from further abuise even with frequent washings. The strong odours of foods such as onions, garlic and fish wash right off with soap and water instead of penetrating the skin and lingering for hours. Derma Guard helps protect against commercial cleaning compounds, industrial oven cleaners and drain cleaners. Derma Guard is safe to use around the Garden and does not have any effect when in contact with plants. It provides a barrier against tender or abused skin that can be irritated by repeated digging, sawing, hammering, pruning, lawn mowing etc. It also protects skin from further abuse, even with frequent washings. Derma Guard carries on protecting the skin despite repeated washing for 4 to 5 hours. Derma Guard helps protect against toxic weed killers, poisons, fertilisers, garden sprays, motor mower fuels and oils, bacteria from potting mixes, paint thinners and strippers, plant sprays, insecticides, dirt, and swimming pool chlorine and chemicals etc.